Update (7/4/2018): The City of Dripping Springs reached a settlement agreement with the City of Austin, Barton Springs/Edwards Aquifer Conservation District, the Hays Trinity Groundwater Conservation District, Save Barton Creek Association, Protect Our Water, and several private property owners. Update (5/21/2018): On May 21, the State Office of Administrative Hearings (SOAH) held a preliminary hearing to decide, among other things, who will be affected parties in the contested case against the Texas Commission on Environmental Quality’s (TCEQ) proposal to issue a permit to allow the City of Dripping Springs to directly discharge its treated sewage into Onion Creek. TCEQ had previously denied party status to the District, contrary to the recommendation of its own Office of Public Interest Counsel. The SOAH administrative law judge granted both the Barton Springs/Edwards Aquifer Conservation District and Hays Trinity Groundwater Conservation District standing in the contested case. Additional information is available by searching the Public Case File through the SOAH website, Docket number: 582-18-3000. Update (11/15/2017): Discussions continue regarding the Dripping Springs requested wastewater discharge permit. Dripping Springs and LCRA executed a settlement agreement on October 27, 2017. And on November 8, the TCEQ issued the long-awaited Response to Comments (RTC) to address comments on the draft permit submitted back in November of 2016. The RTC provided responses to 160 separate issues and concerns raised by commenters. The issuance of the RTC also triggers a 30-day period where commenters have an opportunity to formally protest and request a contested case hearing. This period expires on December 8, 2017. Update (9/23/2016): The Dripping Springs public notice has been published. This is also a combined notice of the public meeting which will be held on November 10th. 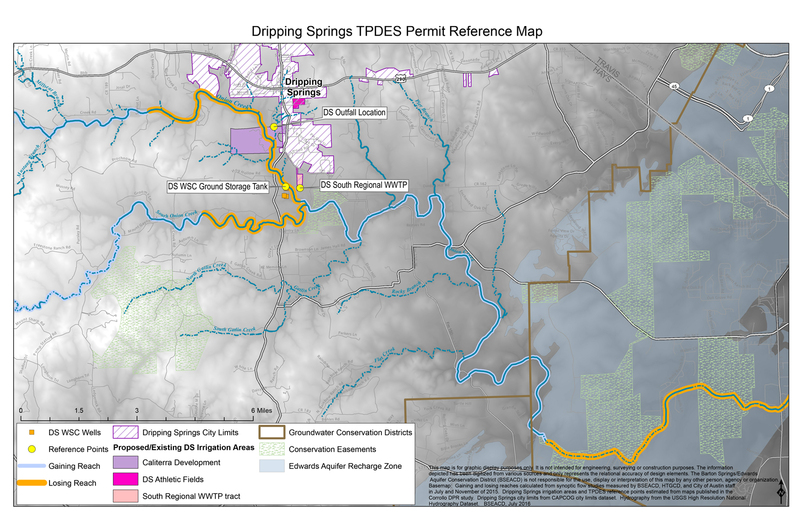 At the June 30, 2016 Board Meeting, the Board of Directors adopted a resolution, position statement, and summary of concerns regarding the recently proposed Dripping Springs TPDES (Wastewater) Permit Application. Groundwater users in the District rely on the Trinity and Edwards Aquifers and Onion Creek recharges both aquifers. The proposed wastewater discharge point is upstream of Trinity Aquifer and Edwards Aquifer recharge areas, so there is potential for groundwater users to be impacted if water quality in the creek is degraded.